The measurement of the stability of a new chemical entity in a matrix such as plasma helps in identifying and understanding the lability of known structural moieties (e.g. amides, sulphonamide, esters, lactones, lactams to name a few) in molecules in the prioritisation of these for in vivo PK studies. High instability can result in aberrant PK results due to high clearance and short half-lives. Species differences in plasma stability for molecules is not uncommon and should be determined. 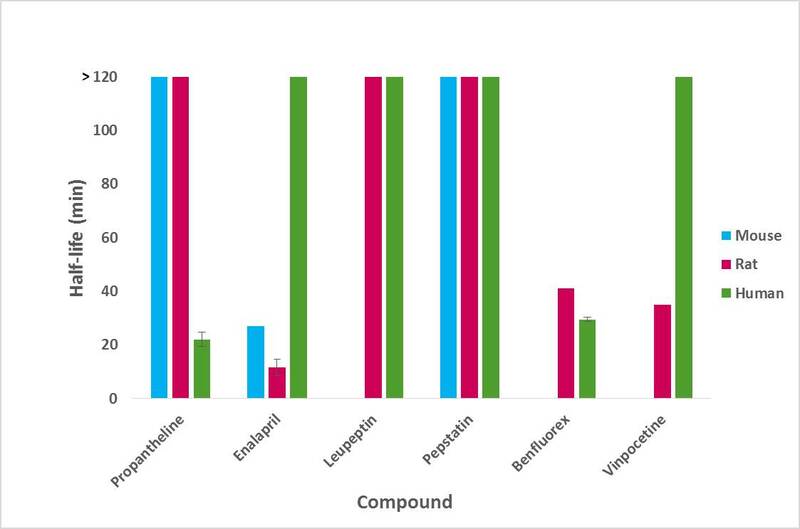 Sygnature’s plasma stability assay measures the stability of molecules in plasma from either mouse, rat and human (please enquire about other species). The molecule to be tested and controls (positive and negative) are incubated with plasma for a defined period and the percent remaining and half-life determined. Propantheline (human), Enalapril (mouse & rat), Vinpocetin (rat) and/or Benfluorex (human and rat) are included as positive control compounds. Pepstatin or Leupeptin are included as negative controls. Figure 1 Stability of compounds in mouse, rat and human plasma.